This has got to be the best storyline going into WrestleMania! It’s safe to say after 11 years with the WWE, Kofi Kingston is finally getting the spotlight he deserves. Kingston has been a household name within the WWE for a decade, but if we look back on his career, we will only remember him for his mid-card run, his record-breaking tag title reign with the New Day and his short Royal Rumble stints. If the WWE needed high flying matches or some fancy stuff to do in the Royal Rumble match, Kofi Kingston was always the man the company sought after. But no matter how many times he proved himself to the company, he couldn’t get anywhere near the main event picture. But things have changed right now, and Kofi Kingston has finally fought his way into the WWE title picture. He had to work twice as hard as everyone to get half of what they have. These were the words spoken by Byron Saxton last week when Vince McMahon once again denied Kofi Kingston from getting a WWE title match at WrestleMania. Kofi Kingston pulled off the most significant victory in his career so far after he defeated five superstars in a grueling gauntlet match. Two of those superstars were former WWE Champions, and it was poetic that he last eliminated Randy Orton, the person reportedly behind Kofi’s push coming to a halt way back in 2009. Vince McMahon's involvement has made this feud even interesting, and we can say this is the best story the WWE has told in a long time, even better than the Raw Women's title picture. We are only two weeks away from WrestleMania, and WWE could officially announce Kofi Kingston as the challenger for the New Daniel Bryan’s WWE Championship at WrestleMania on this week’s SmackDown Live. Big E and Xavier Woods contemplated about leaving the WWE after Kofi got screwed last week. Few other superstars also have shown their support on Twitter. With Vince McMahon doing all his dirty work for keeping Kofi Kingston away from the big WrestleMania match, help might come from the most unexpected place for Kofi Kingston. 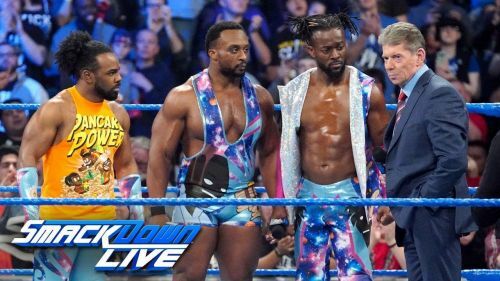 With all the support Kofi’s been receiving from his fellow superstars and his New Day brothers, we could see them stepping up for Kingston’s cause on this week’s SmackDown Live. WWE could plan a mass walk-out segment where the babyface superstars of the SmackDown Live roster might stand up for Kingston and threaten to quit the company if Kofi doesn't get the opportunity. Vince McMahon will have no option but to give Kingston the WWE Championship match at WrestleMania. The angle could prove to be the best way for Kofi Kingston to enter WrestleMania. It will not be the first time Superstars do a mass walk-out on the authority figures. Remember the time when the Raw superstars walked out of Triple H on the October 10th, 2011 episode of Raw? Not only the superstars walking out on Vince McMahon will prove that Kingston has the support of the roster, but also will help him in entering WrestleMania as the biggest babyface of the event. Kingston has waited long enough to get his career-defining moment, and it's about time the WWE recognizes his potential and give him his crowning moment at WrestleMania. We hope that Kofimania will run wild on April 7th at the Grandest Stage of Them All. 4 Shockers Vince McMahon Could Be Planning For SmackDown Live - Major title change, Sullivan fights his first match?